You’ve probably heard of a Vespa (Wasp) scooter but, unless you’ve already been to Italy, possibly never encountered the Ape (Bee) three wheeled vehicle. 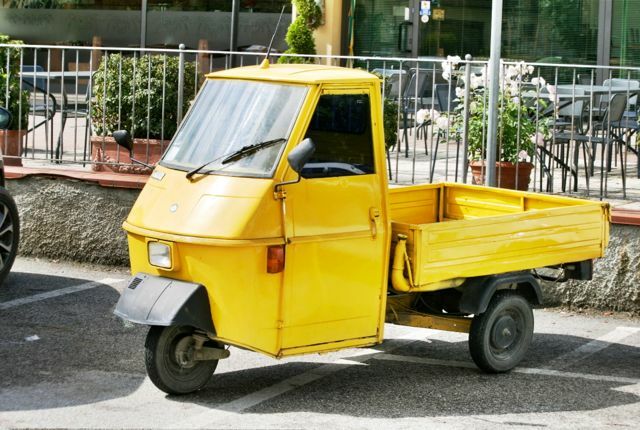 The Ape (pronounced Ah-pay) has a maximum speed of around 30km/h and it won’t be long until you are stuck behind one when driving on the narrow country roads of Tuscany And Umbria. The Ape is used by schoolchildren too young to take their driving test, local councils and local farmers. Despite its slow speed, the Ape can take a heavy load and is a useful workhorse, the only surprise is that they haven’t caught on outside Italy.